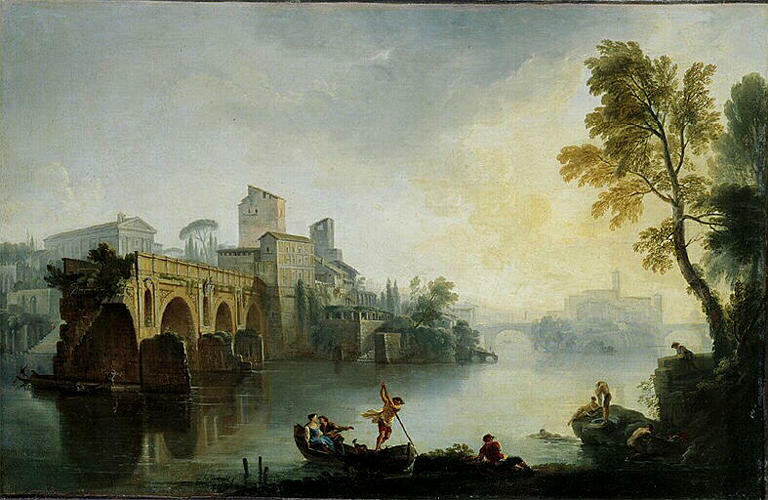 In this beautiful depiction of Rome, a soft dawn light slowly envelops the scene. In the foreground a fisherman is standing over a woman who wraps the daily catch in a sheet, presumably ready for market. Beyond them a couple lazily relax, whilst on the far bank herdsmen watch over their grazing cattle. However, these figures are not the focus of the work, but serve to animate the beautiful historic landscape in which they are set. Spanning the calm expanse of the Tiber is the rhythmic arches of the Ponte Sant’Angelo, which leads the eye to the imposing bulk of the Castel Sant’Angelo. In the background, surrounded by dawn mist, is the Vatican, dominated by the instantly recognisable silhouette of St. Peter’s. Jean-Baptiste Lallemand has created a delightful contrast in this painting, where monumental architectural achievements are viewed through a prism of complete tranquillity and calm, before the start of the hustle and bustle of daily urban life. This vista was clearly a favoured view of Lallemands. In addition to a gouache sketch in Chicago², there is another fractionally larger, but otherwise identical, depicts the Ponte Rotto, the oldest stone bridge in Rome which dates from the second century BC. Again Lallemand is referring to Rome’s historic status, as a city whose primacy and magnificence stretches back to antiquity. ¹ Fletcher, B., Sir Banister Fletcher’s a History of Architecture, (20th ed. Architectural Press, London, 2001) p.719. ² Smart Museum of Art, University of Chicago, no. 2006.96. ³ For more on the painter’s life and works, see Jean-Baptiste Lallemand. Un Paysagiste dijonnais du Xviii siècle, exh. cat, Museé des Beaux-Arts, Dijon, 1954.